BRUÉ - Carte de l'Amerique septentrionale Rédigée par A.H.Brué géographe. BRUÉ, A. - Carte de l'Amerique septentrionale Rédigée par A.H.Brué géographe. Carte de l'Amerique septentrionale Rédigée par A.H.Brué géographe. - BRUÉ, A. 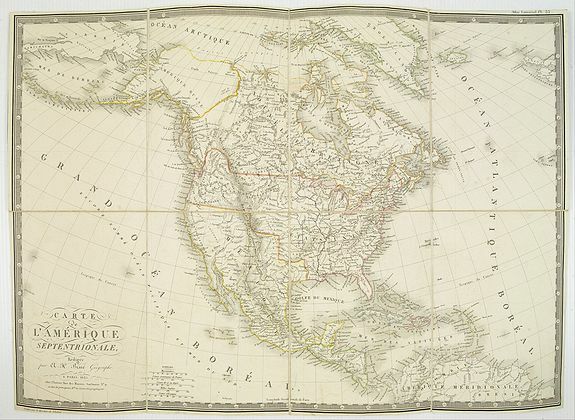 Title : Carte de l'Amerique septentrionale Rédigée par A.H.Brué géographe..
Map maker : BRUÉ, A.. Size : 14.3 x 20.0 inches. / 36.3 x 50.8 cm. Description :Detailed dissected folding-map of North and Central America by Brué, originally published in Atlas Universel but here mounted on linen and intersected in 8 parts. Next to the title cartouche a blind stamped publisher's mark : "carte encyprotipe du fonds de l'auteur." Prepared by A.Brué. The map is a marvelous post-Lewis & Clark production, combining excellent detail from the expedition in the Northwest with information from Pike, Humboldt and others. Excellent detail in Texas. Remarkable Indian details. Excellent detail in Western Canada and Russian America. Condition : Mounted on linen, dissected in 8 parts, each 185x130mm. Copper engraving map in out-line colour. With blind stamped publishers mark.